So we are off to Comic Con in just a few short moments. This will be a big show for us as usual, so here's one last news roundup before we vanish into the comic realm forever (or, for the week)! -Our theater screening is still happening on Thursday, July 23rd in La Jolla! Online ticket sales are now closed, so if you still want tickets, come get one at our Comic Con booth, or (hopefully) at the door that night. Get on either of those things as soon as you can, too- The online ticket sales were huge this year and we could be looking at a sellout. -At Comic Con we will not only be selling all our usual merchandise, but you will also have the first shot at buying our new shirt that Derrick designed. It's quite explosive! We will also have CON EXCLUSIVE "ELITE" BLACK SEXY64 SHIRTS to sell to those who can first claim them! Only THE sexiest gamists will be allowed to purchase these wares. We'll have new posters too, and... Gosh, so much new merch! Come buy this stuff, you nut! 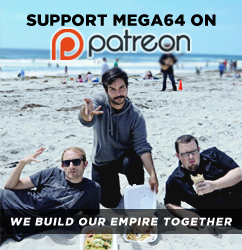 -We are making a limited run of 20 Special Edition Con Exclusive Posters that we are, once again, only giving to people who come ask about our super-difficult Mega64 trivia challenge. Are you brave enough to face this challenge for a super-rare sick poster, bro? -Rocco will be a guest on the "Beyond The Gaming Medium" panel, on Friday at 3:30 in room 30AB! -The whole Mega64 crew will be guests on the 91x morning show on the radio here in San Diego on Friday morning (EDIT: ACTUAL TIME TBA) We'll be hanging out and broadcasting to you from outside the con! OH GOSH DID WE FORGET ANYTHING? OMG YOU GUYS A PODCAST!!!!!!!!!!!!!!!! Audio version here. K WE'RE GOING TO COMIC CON WE'LL POST MORE NEW VIDEOS SOON OMG GUYS BYE!!!!!!!!! !